Rome's so-called Nuvola conference centre set to open in October. Construction work on the so-called Nuvola conference centre in Rome's southern suburb of EUR has finally reached completion, after €236 million and 18 years of controversy. Designed by prominent Italian architect Massimiliano Fuksas, the giant complex will be opened by Italian premier Matteo Renzo on 29 October. The inauguration will be screened live on RAI 1, during which the centre's official name will also be revealed. 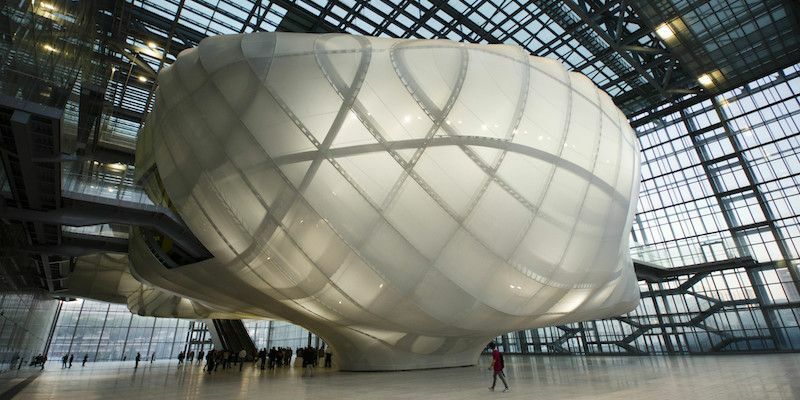 Known so far as the Nuvola (Italian for cloud), the futuristic project has suffered from extensive delays and spiralling costs since it was approved officially in 1998, under the tenure of then mayor Francesco Rutelli. The giant conference centre includes a 9,000-sqm plenary hall which can host 6,000 people, a 7,000-sqm forum area and an auditorium that can host around 1,800 people. Its design comprises 20,000 tons of steel and 58,000 sqm of glass. The structure has already begun securing its first bookings, including an international delegation of lawyers in 2018, and Fuksas claims the centre will bring €350 million to Rome each year. In 2014 the project came in for severe criticism from the authority for the supervision of public contracts (AVCP) over its “excessive slowness” and “disproportionate” sums paid out to artistic director Fuksas, who susbequently left that role. The company that owns and manages the 27,000-sqm site is Eur Spa, whose majority shareholder is Italy's ministry of finance.